I was sent this article from observer.com by Benjamin Hardy: Why Keeping a Daily Journal Could Change Your Life. I love the author’s observation that the time spent in your journal is yours, free of anyone else’s opinion or agenda. Journaling is such a healing practice – more than we can ever know. One of the first bits of advice I give my students at the University of Kent when they’re struggling with their writing is to pick up a pen and enjoy the leisurely beauty of writing by hand. It worked for Shakespeare. That’s it for now because I have to write all of this down in my journal! Until next week, happy writing! All Things Stationery reviewed the Paperblanks Fortuna notebook. What a stunning cover, as usual. Love those notebooks. And she got it sent to her for review! Lucky. Adam over at The Desk of Adam reviewed Pelikan’s Edelstein Topaz ink. I don’t think of aqua blue when I read the word Topaz but apparently Adam and the folks at Pelikan do and that’s the colour of this gorgeous ink. And check out this way cool digital typewriter at Writer’s Circle called the Hemingwrite. Cool writer’s gear. I journal by hand but I write with my keyboard, if that makes sense, so this is very appealing to me. Imagine, an electronic device devoted to writing, and nothing else. No sneaking off to Facebook or YouTube! Great post by Jinnie on Three Staples on discovering Field Notes and how that changed her journaling habit. Great pictures too. And if you love orange (who doesn’t?) this post by Mary at From the Pen Cup will have you ordering something orange before you’ve finished reading it. Mary is always entertaining and so informative. 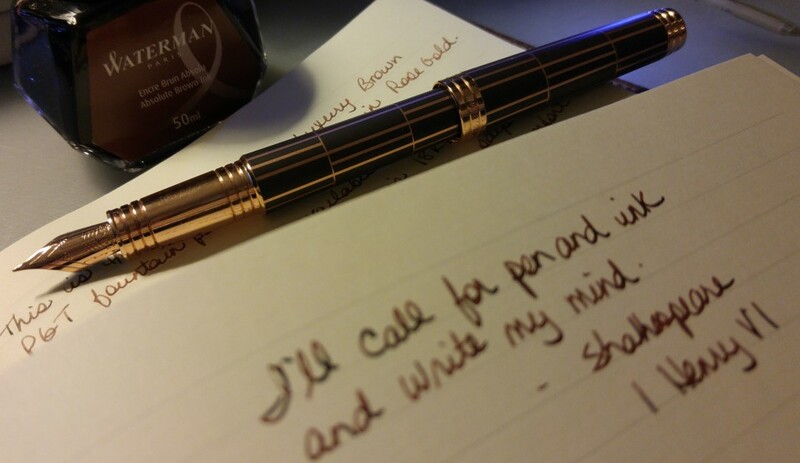 I love my purple Al-Star and this post has me considering the orange one!